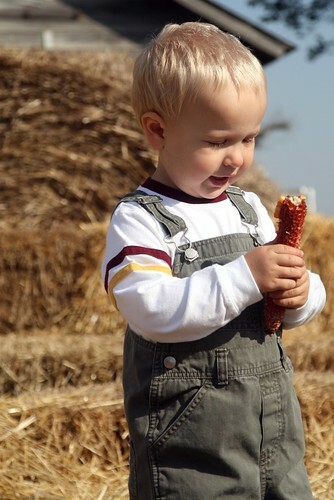 That’s Jacob over at the pumpkin patch near us. He found something to inspect, and spent awhile doing it. As he does. He’s taken a liking to our cat, Nash. Jacob calls him “cat Nash”. Never just “Nash”. When we get home from somewhere, if the cat is around, Jacob will say, “Hi cat Nash! Hi cat Nash!” Then he’ll bend over, touch his head to Nash’s back, and try to give him a hug. Nash, surprisingly, doesn’t mind this. Jacob enjoys being a part of — well, everything. He will repeat back new words and phrases, trying to learn how to say them, even if he doesn’t understand what they mean yet. His favorite recent outdoor discovery is that grain silos are all over the place. He’ll point them out excitedly as we drive down the road. I had never noticed just how many there are. One day, he pointed at a water tower and said “SILO!” I understood why he said that, but I told him it was a water tower. He remembered that, and learned to tell them apart in a day or two. Then one morning he surprised me with, “Water tower. Water inside.” How he figured that out, I don’t know. 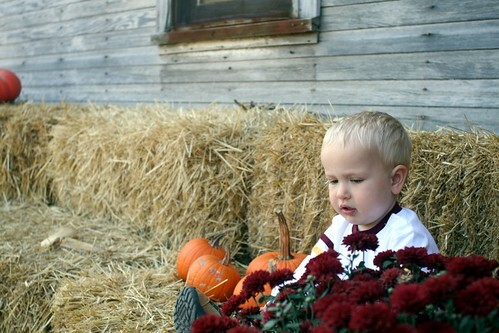 There’s another photo of him at the pumpkin patch. The other day, I accidentally triggered our smoke alarms while checking one for a battery. After that, Jacob loved to say “BEEP! BEEP!” Sometimes followed by “Smoke larm. Hurt ears.” We learned how to say BEEP BEEP loud and also quiet. He’s certainly a lot of fun at this age. He certainly does sound like he is a lot fun. Great pictures.